In 2015-2016 we have focussed our efforts and funds on the collection and transport of the equipement for the new surgery in the Kilimanjaro Christian Medical Centre (KCMC) in Moshi. We have received several contributions from Rijnstate hospital in Arnhem, Laurentius hospital in Roermond, Slingenland hospital in Doetinchem and the UMC’s in Nijmegen and Maastricht. The majority of the equipement was surgical instruments but it also included surgical chairs and furnature for exmination rooms. Amongt others a drilling machine and a surgical lamp had to be purchased. This used a significant amount from the foundations resources but it made the equipement complete. End of 2015 Ricoh SCM bv in Bergen Op Zoom offerd to coordinate and organize the transport of all the equipment from the Netherlands to Dar Es Salaam. In February 2016 the goods were transported free of charge by Maas Transport & Expeditie bv from the temporary storage in Oosterbeek to Bergen Op Zoom. Ricoh & DHL carefully wrapped all goods and arranged the transport to Dar es Salaam. The whole transport, including the arrangements with customs in the Netherlands has been paid and arranged by Ricoh SCM bv. When the goods where delivered in Moshy, the staff of KCMC immediately started to use the instruments and other items. The equipment was received with great enthusiasm. The shipment also contained items for the department in Dar es Salaam which they collected in Moshy. Both departments have received a good amount of surgical plates and screws to treat jaw fractures. Another important development in 2016 is the appointment of two new members of the foundations’ board members. Rob Mooren and Albert Witkampf joined the foundation while Jan Laverman has retired from it. Scientific progress was also made. A follow-up study of patients with tumors in the symphyse area of the mandibula, reconstructed with previously mentioned techniques, had been completed. This article has been offered to the International Journal of Oral and Maxillofacial Surgery. Both Thijs Merkx and Paul Stoelinga paid a visit to Dar es Salaam from 8 to 14 December 2014. The primary goal was, together with Dr. Elison Simon, to visit Kilimanjaro Christian Medical Center (KCMC) in Moshi and to discuss the possible establishment af a satellite department of Oral an Maxillofacial Surgery in that hospital, linked to the center in Dar es Salaam. It was also intended to visit the new facilities in Muhimbili hospital, made possible by a donation of the Nina Harris Pebley Foundation through rhe IOMS Foundation, that where finally completed. Last but not least it was also planned to see some of the recent patients that were reconstructed after ablative surgery for Ameloblastomas. It was a pleasant surprise to see that the new operating theatres were both functioning well, including the new examining room and conference room. 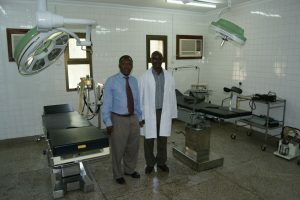 All the equipment that was donated through the IAOMS Foundation was in place along with the instruments needed for treatment of a large number of patients. It was also very satisfying to learn that the number of patients that had benefitted from the novel recontruction method had grown to fifty. It has turned out that the donation by KLS-Martin Company of Smart plates and screws has become a huge succes particularly in combination with the technique of reconstruction as introduced by the department in Nijmegen. A follow-up study is underway to assess the tongue function in case a resection also included the symphysis of the mandible. The journey to Moshi was also very rewarding in that an intention was expressed to come to a satellite department in KCMC with the help of the Dutch Foundation. The current medical staff and the director were very much in favor to establish such a department. It was agreed that a list of items necessary to furnish the department is to be put together along with a list of instruments needed. Government agreement, however, will still be necessary to come to a final decision. Discussions on this started early 2015. It looks as if the goal of the foundation to establish satellite departments in the three large regional hospitals has become somewhat less hypothetical. It is hoped that in 2015 major progress will be made to establish the new department in Moshi. Dr. Elison Simon, Dean of te faculty for Dentistry, and Dr.Jeremiah Moshy, head of the department for Oral- and Maxillofacial surgery, in the new operating room. The situation at the department of Oral & Maxillofacial surgery in Dar es Salaam has changed in that Elison Simon has stepped back as chairman since he has been appointed Dean of the Dental School. Jeremiah Moshy has followed him as Chairman. The department has continued to train two residents a year which so far has resulted in an increase of OMF surgeons from 4 in 2008 to 12 in 2013. Some of the trainees come from neighboring countries and return to their home land after completion of their training. The main project, supported by our Foundation, remains the reconstruction of patients with aggressive odontogenic tumors. Thanks to a generous donation of KLS-Martin company there are sufficient numbers of plates and screws available for another 30 patients. Till present more than 40 patients have benefitted from this procedure. The foundation has supported the travel expenses of dr Simon to Johannesburg and Barcelona. In South Africa he was invited to report on the ongoing study on the before mentioned reconstruction method, while in Spain he was invited to report on the efficacy of the IAOMS sponsored educational program that ran from 2005-2008. The original aim of the Foundation, to support the establishment of a second department of Oral & Maxillofacial surgery in the densely populated area around Arusha has been hold up by the board of directors of KCMC hospital. There happens to be a change in the management of that hospital that will become effective in the course of 2014. We plan to save the planned amount of money available to help establishing such department until the negotiations between the Tanzanian OMF surgeons and KCMC will be reopened.